Bricks 4 Kidz provide in-school workshops in primary schools teach the principles of science, technology, engineering and maths through LEGO®. 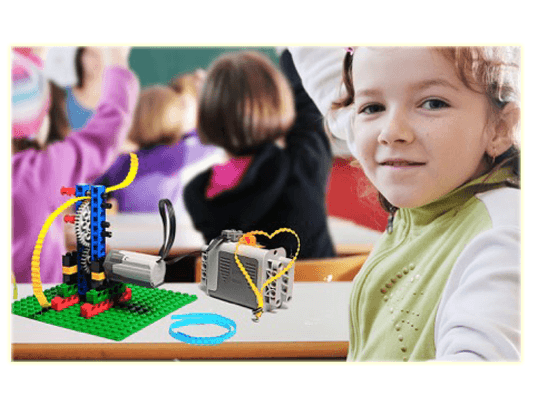 Bricks 4 Kidz provide LEGO® Technic workshops in primary schools. These workshops teach the principles of science, technology, engineering and maths through LEGO®. A Bricks 4 Kidz workshop uses LEGO® that kids love, to deliver hands-on lessons correlated to cross-disciplinary curriculum objectives. Our programmes are suitable for creches, primary and secondary schools with workshops held in classrooms during the school day. The Bricks 4 Kidz approach to learning is imaginative, multi-sensory and fun, creating a dynamic learning experience for your students. Workshops are one hour in duration and can be customised to suit your schools specific requirements. All students will build motorised models using Brick 4 Kidz project kits and lesson plans. Explore the exciting sport of riding and racing personal watercraft as you build our clever jet ski model. Students will compare and contrast a jet ski with a traditional motor boat and discuss important safety issues. Find out why it’s all about the accelerator! Students will learn the origin of the word tsunami, the source and motion of a tsunami, and the size and speed of the waves. Included in the lesson is a map of the “ring of fire” around the Pacifc region, where most tsunamis occur. The discussion time closes with an assurance to students that a tsunami is not something likely to occur next time they go to the beach, to put their minds at ease. If you would like to host a Bricks 4 Kidz LEGO® workshop in your school, please contact us today!